Broadly speaking, there are three types of political or socially-engaged cinema within Hollywood. The first category belongs to movies in which the politics are implicit rather than overt, but can nevertheless be detected or interpreted in the underlying ideological, cultural or racial assumptions and priorities that determine plot structures and storylines, or the way that certain characters or groups of people are represented. Within this category you could place most Westerns featuring Native Americans, not to mention a whole range of science fiction films such as Independence Day, Starship Troopers and Avatar. In the second place – and this category can sometimes overlap with the first – there are films whose overall intention is entertainment, but which nevertheless incorporate ongoing political debates or social issues into their plotlines, and make more overt political statements or messages without departing from the conventions of their particular genre. Here you can find a vast list of films such as Magnum Force, The Green Berets, The Deer Hunter, Top Gun, Apocalypse Now, State of Siege or Django. Last but not least, there are Hollywood movies that are socially and politically engaged, and which attempt to use the mobilising and affective power of modern cinema to criticize, educate and draw the attention of their audience to social injustice and institutional corruption. Here the list of films is shorter than the other two, and this isn’t surprising given that the essential purpose of the ‘Dream Factory’ has always been to provide distraction and entertainment rather than a critique of the established order. But that doesn’t mean that Hollywood doesn’t make such critiques, or that it simply reinforces or reproduces establishment narratives or acts as an unacknowledged instrument of American propaganda. On the contrary, Hollywood has a long and honourable tradition of left/liberal social and political criticism, that includes The Grapes of Wrath, Johnny Got His Gun, the movies of Raul Walsh, In the Heat of the Night, Dr Strangelove, Seven Days of May, Born on the Fourth of July. Even at their most outraged however, Hollywood movies tend to present the abuses they describe as failings or abuses of the system rather than consequences of the system itself. A classic Hollywood trope is the ‘bad apples’ theme; such as the corrupt cops in The Big Heat, who are undone by the courage and integrity of an individual hero or a few good men. The bad apples/lone hero prism, however, has been particularly difficult to apply to the failings of the capitalist economy. Hollywood films that have dealt with this subject tend to reduce the failings of American capitalism to individual ‘greed’ or excess, as personified by charismatic predators, for example in Wall Street, or more recently The Wolf of Wall Street. Both these films tend to glamorize the excess they critique and often seems fascinated and half in love with it. None of this applies to The Big Short. On the contrary, this film is that rare thing – and certainly a thing that we haven’t seen from Hollywood for a long time: an angry and deeply moral indictment of systemic failure on an epic scale. The subject of the film is the 2007/8 subprime mortgage bubble, which capsized the American economy and spread with devastating effect across the world, with a storyline based on Michael Lewis’s best-selling non-fiction book The Big Short: Inside the Doomsday Machine. Lewis’s book tells the story of a handful of misfit investors and hedge fund managers who saw that the subprime mortgage boom was inherently unstable and unsustainable, and made vast sums of money by correctly ‘shorting’ it – i.e. betting that it would collapse. Director Adam McKay, showing the same ability to turn even the most seemingly arcane and impenetrable subjects into compelling cinema that he demonstrated in Moneyball, has turned this story into a darkly hilarious and excoriating portrait of the stupidity, greed, short-termism and outright fraud that brought the American economy to its knees. The complexities of subprime mortgage securities, credit swaps, collateralised debt obligations (CDOs) and synthetic collateralised debt obligations are not the most obviously appealing dramatic material. Most of the film’s viewers – this one included – are unlikely to have even heard of them before seeing the film. McKay clearly regards this ignorance as a facilitator of the disaster he describes, in which even the institutions that were supposedly regulating the US economy did not understand the consequences and the implications of the system they had constructed, or were too busy profiting from it to care. The film makes a conscious effort to educate its audience through a series of half-satirical celebrity cameos in which the actress Margot Robbie explains a subprime mortgage while lolling in a bubble bath; chef Anthony Bourdain compares a CDO to a fish soup, and a glamorously-attired Selena Gomez expounds on a synthetic CDO while losing a roulette bet. In a particularly darkly-comic scene, Ryan Gosling’s spiv investor, Jared Vennet, uses a jenga tower to explain how the entire subprime loan system had always been doomed to collapse, taking its credit ratings with it. Even with these devices, The Big Short is asking a lot in expecting its audience to stick with this world for more than two hours. That it never flags is partly due to its scintillatingly witty and cynical script, and partly to McKay’s sheer verve as a director. Throughout the film, McKay demonstrates an astonishing ability to transform the brain-freezing intricacies of the world he describes into compelling cinema, and he is helped by some riveting performances delivered by an outstanding ensemble cast of actors at the top of their game, from Christian Bale’s borderline autistic, thrash-metal-listening hedge-fund advisor Michael Burry, to Steve Carell’s tormented investor Mark Baum. The fascination the film engenders also lies in the passion and anger that underpins its satirical bite. It contains a lot of laugh-out-loud moments and moments to savour, such as the mortgage applicant who successfully obtains a mortgage in his dog’s name, or the regulator at the hapless Standard and Poor who wears special sight-enhancing glasses, but this is real laughter in the dark, because McKay is not amused or fascinated by the failings that he skewers so brilliantly and remorselessly. 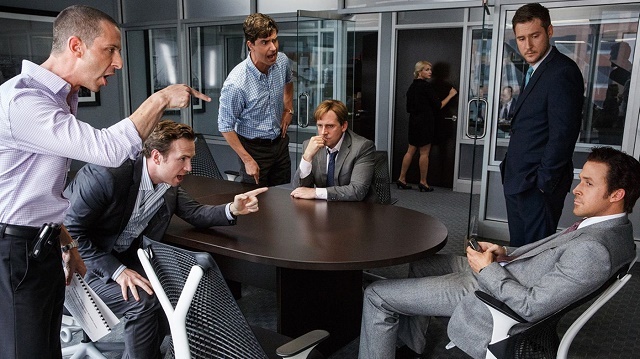 Beneath the satire and the jokes, there is real outrage and sadness in The Big Short’s depiction of an out-of-control and unregulated system that was essentially corrupt from top to bottom, from arrogant know-it-all financiers at Goldman Sachs to the Florida estate agents who boast of selling mortgages to immigrants who barely understood their terms. This is a dismal tale, and there are no heroes or good guys to make it palatable, or allow the audience to leave with a warm glowing feeling. Even the conscience-stricken and moralistic Wall Street outsider Mark Baum makes a killing, together with the other nerdy investors and outsiders who saw the crash coming and are constantly incredulous at what they were able to get away with. Their triumph only confirms the jawdropping recklessness and irresponsibility of the system that enabled them to profit from its own inevitable collapse. As the film makes clear in its biting conclusion, only one person in the United States was ever punished for such behaviour, and the banks and financial institutions that enabled the disaster to happen were essentially rewarded for failure with the great bailouts that paved the way for ‘austerity.’ As one character remarks, “they’ll blame all this on immigrants and the poor.” And they did. That’s how it happened, and they’re still doing it. All this makes this sharp, angry film essential viewing for anyone who wants to get an idea of the mess we’re in. It may not tell us how to get out of it, but it is a bleakly enlightening account of how we got there, and how we might end up in pretty much the same place very soon. Now we would see that how we can be get the free money of gta.